Experts in medical marketing.medical SEO.growth strategies. Your medical practice is specific, specialized, and unique. Your online brand should be too. 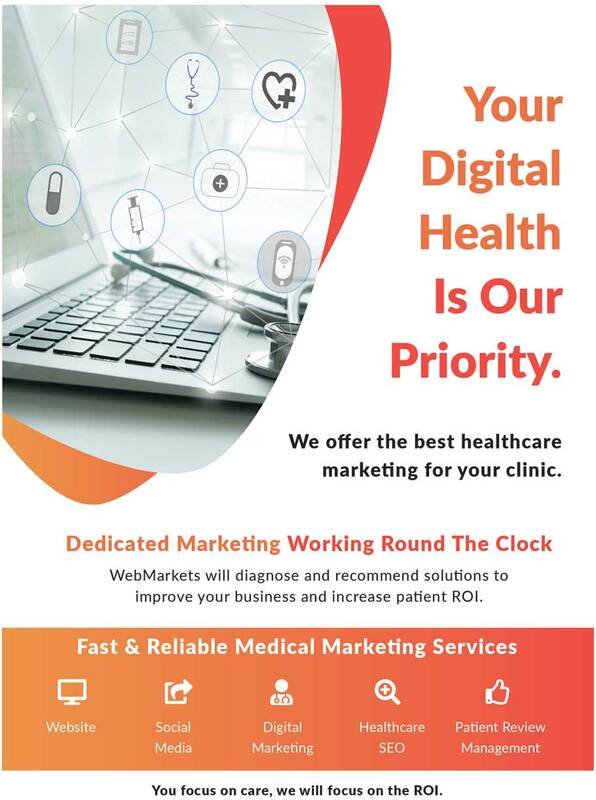 With the experts at WebMarkets Medical, we can improve your patient marketing processes. WebMarkets Medical has a trusted, reliable team of website professionals to manage your medical website. The SEO team at WebMarkets Medical helps to identify profitable target search terms and optimize your website to increase web traffic. In today's fast paced, online environment, if your medical clinic does not have a Google presence, you are instantly losing credibility and future patients. From keyword research to search engine marketing to website conversion, WebMarkets Medical has all of your search engine bases covered. Having a solid social media presence is essential when connecting with your patients. At WebMarkets Medical, we identify your unique social media strategy and implement the necessary measures to increase your online presence and generate more patients to your practice. Online reviews are vital for online success. The Review Doctor is a specialized product that generates positive online reviews for your practice on such platforms as Google, Yelp, Facebook, and Healthgrades. Using a specific online directory to build your medical practice reviews? No problem. WebMarkets Medical will integrate with any custom API on the market. To be effective in an online world, your hospital website needs to effectively position your hospital's brand in the most effective way possible. Nowadays, every doctor and physician needs to have a positive and credible online presence. Are you utilizing the Internet to brand your physician name? 70% of social media users purchase the brands they follow. Increase your following, improve education, and increase the revenue of your dental practice. With hundreds of thousands of potential patients online every second, how are you utilizing the Internet to brand your health insurance company? Every medical device company and product has their own specific set of competitive advantages. Your medical devices are specific, specialized, and unique. So should be the online brand. With the emergence of the Internet, more and more medical device companies are taking advantage of online marketing tools to improve sales. With the experts at WebMarkets Medical, we can improve the brand perception of your medical device company and its products. Every DME company and product has their own specific set of competitive advantages. Your medical equipment is specific, specialized, and unique. So should be the online brand. With the emergence of the Internet, more and more medical equipment companies are taking advantage of online marketing tools to improve sales. With the experts at WebMarkets Medical, we can improve the brand perception of your DME company and its products. It is no longer a luxury for a DME company to have an excellent online presence. It is now a must. The average clinic patients checks their phone over 50 times per day. Having a mobile presence will connect with your patients and improve their loyalty to your medical practice. WebMarkets Medical has teamed up with a group of medical IT professionals to integrate with a variety of EMR software providers. This solution will save your medical administration time and money. We help to eliminate paper forms by converting them to online forms from your website. This eliminates wasted time and maximizes office admin efficiency. And yes, depending on your EMR, we integrate patient forms directly into your system. Complete paperless patient forms. It's the wave of the future and it's HIPAA compliant. Allow patients to pay online and turn your medical website into a cash machine. We securely accept payments via the web by adding multiple custom forms to your website.